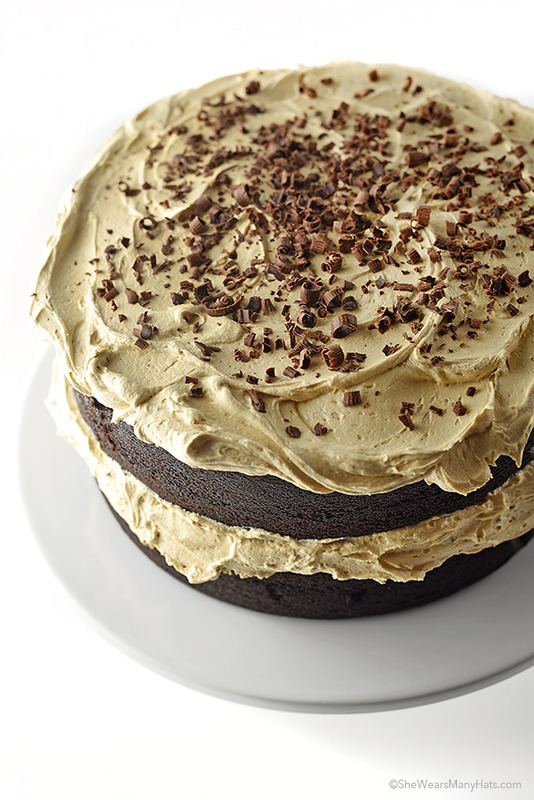 Chocolate Stout Cake Recipe with Espresso Buttercream is the definition of indulgence. Invite your favorite chocolate-loving friends, because dessert this good is meant to be shared. About eight years ago when I was still new to this whole blogging thing, I shared about my favorite cake of all time, served at the French Broad Chocolate Lounge. I was practically raving about it then and quite possible foaming at the mouth. I think I used the phrase “edible masterpiece” and “wedding cake worthy”, which might seem a little over the top but hey, have you tried it yet? To no surprise, it is still my favorite cake so of course the praise continues. However, recently I decided it was time to make a Chocolate Stout Cake myself and holy wow, it is decadence and chocolatey perfection in a slice. 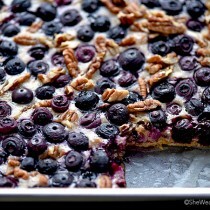 I’m warning you now, it is so rich and indulgent that more than a slice seems sinful. Plus, this recipe makes a big cake, so make sure you have plenty of chocolate-loving friends around to share. 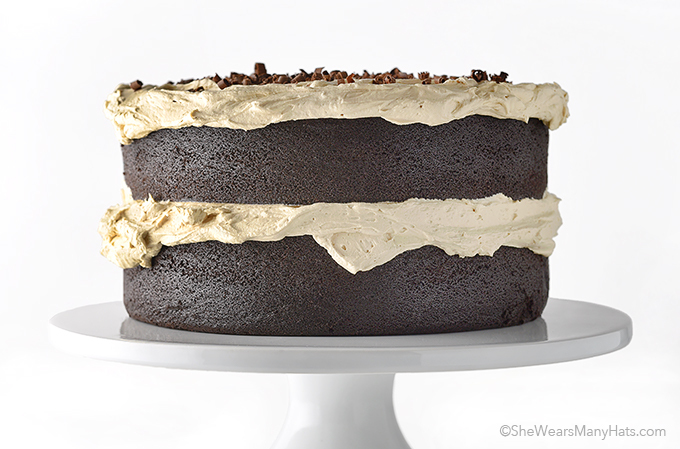 Chocolate Stout Cake Recipe with Espresso Buttercream is perfect for any celebration, particularly St. Patrick’s Day. The stout seems thematically appropriate, wouldn’t you say? Fore the record, I’ve seen this very same cake recipe in several places, on Bon Appetit and the King Arthur Flour website, just to name a few. That must be a good sign, right? From what I can tell the original source is the Barrington Brewery in Great Barrington, MA. The stout cake recipe is ever so slightly adapted. 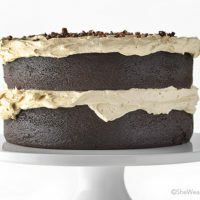 Instead of using the frosting recipe shared with the other recipes, this recipe uses espresso buttercream, harkening back to the cake I’ve mentioned before at French Broad Chocolate in Asheville, NC. 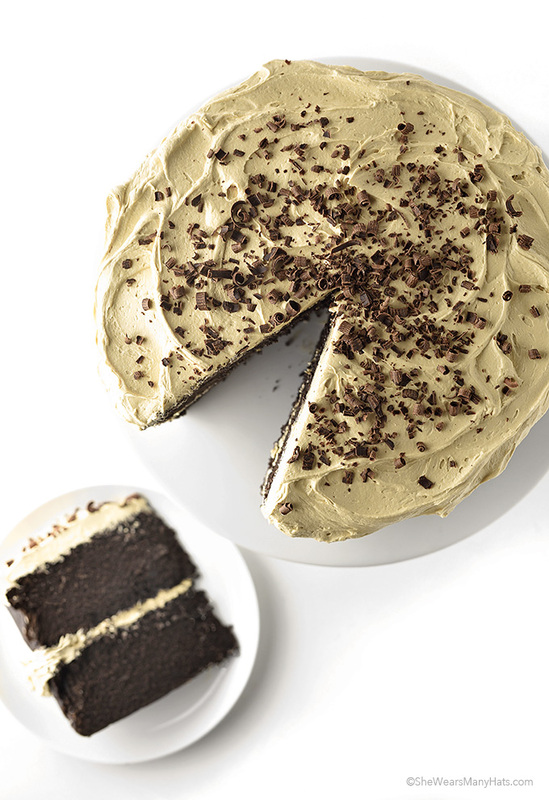 This decadent Chocolate Stout Cake with Espresso Buttercream is the quintessential indulgent dessert for a special occasion. 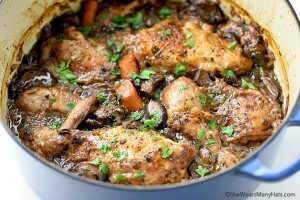 Add stout, butter and cocoa powder to a large, heavy saucepan. Warm over low heat until the butter melts, whisking occasionally. Whisk until smooth. Set aside; cool to room temperature. 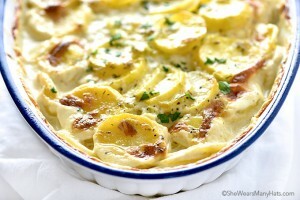 Separately, in a large mixing bowl, beat together the eggs, sour cream and vanilla extract. Using an electric mixer, mix in the stout-butter-cocoa mixture until combined. Mixing at low speed, gradually add the flour mixture; mix together. Stop to scrape down sides and bottom of bowl; mix again for 1 minute. Divide batter evenly between prepared pans. 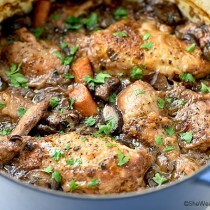 Spread evenly in pan. Bake the layers until a cake tester inserted into the center comes out clean: about 35 minutes for 8-inch pans; about 45-60 minutes for 9-inch pans. **** Remove the cakes from the oven and place on cooling racks to cool in pans for 10 minutes. Carefully turn out cakes and place on cooling racks to cool completely before frosting. Beat together the butter and espresso powder on high for 4 minutes. Stop scrape down bowl and beat for another minute or so until most of the espresso granules disappear. Gradually beat in confectioners sugar and vanilla extract. Scrape down bowl. As needed, beat in a tablespoon of milk at a time to achieve desired consistency. Use to frost completely cooled cake. * I used a blend of natural and Dutched dark cocoa. King Arthur recommends 100% Dutched cocoa. ** Another option is to divide the batter between three 9-inch round cake pans. It will still make a large cake, but the layers will cook quicker. ***I like to use Baker’s Joy. It works like a charm. ****Cook times are a rule of thumb and may vary. Chocolate cakes tend to take longer to bake. Please don’t skip checking to see if the cake is done with a cake tester or toothpick inserted into the center comes out clean before removing from the oven. I thought my 9-inch round layers would never get done. It took 64 minutes to be exact until they were done. I live a tad over 3000 ft elevation. I made no changes to the recipe ingredients or temperature, but it did take longer. If there is any question in the accuracy of your oven temperature, be sure to use an independent internal oven thermometer. I once had an oven that was 15 degrees off, which isn’t a big deal if you’re roasting chicken, but if you’re baking, it can make all the difference. W.O.W. I say I’d have to eat this for breakfast, since it has coffee in it. I’d be up all night if I ate it after dinner! 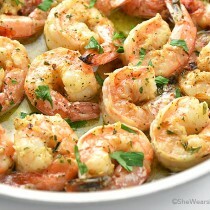 😉 Looks delicious!!! 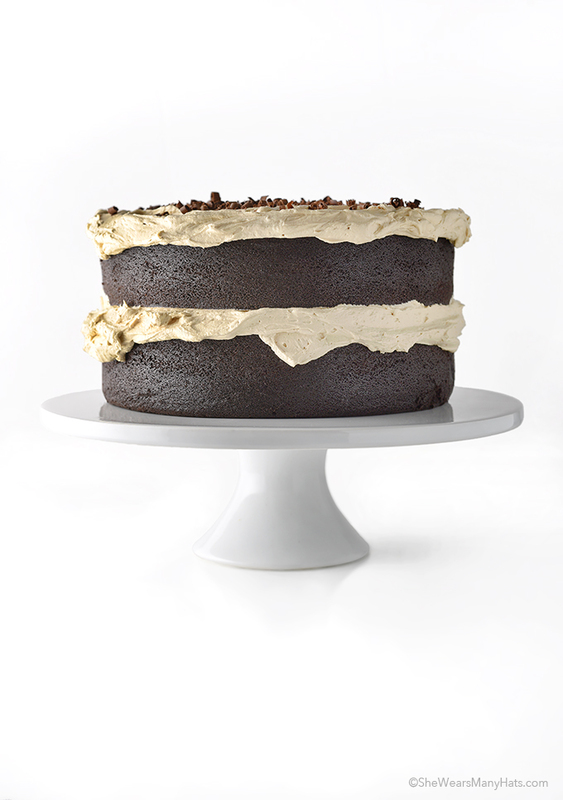 This chocolate stout cake with espresso and buttercream is looking so delicious and mouthwatering! Just can’t wait to make it on my own! 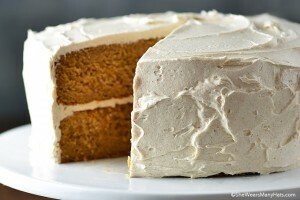 I think espresso and buttercream are making this cake too much yummy! Thanks a lot dear for sharing this super yummy cake recipe.